A few months ago when I presented my thoughts on the evolution of money & technology at a TEDx event, I ended my talk on a Hitchcockesque note. I asked my audience what they thought was going to be the definition of a career 15 years in the future, when 50% of our current jobs in the manufacturing and services sectors will be replaced by dexterous machines and self- learning AI capable of assimilating information at rates exponential to human cognitive capacities. This question was not meant to present a doomsday scenario, but rather to entice my audience to contemplate on the future of the workplace. Before we head off into the future, let’s look at how the global workplace landscape is currently evolving. A decade ago, employees were worried about losing their jobs to outsourcing. Today companies like Amazon’s Mechanical Turk, ODesk and LiveOps can gather teams on the cloud to perform research, sales, marketing and almost any other task. Companies like Accordion Partners are redefining the face of the investment banking industry by furnishing free-lance financial experts who work with a plethora of competing Wall Street companies, providing them with technical expertise on a project to project basis. The extended workforce is gaining breakneck momentum, with a number of Fortune 100 companies having doubled their outsourced talent pools in the last two decades. Technology is further adding to this transition, allowing companies to hire talent irrespective of mobility, location or borders. This trend isn’t reserved to a certain sector either. Engineers, tech specialists, healthcare workers and business professionals are all part of this transition, working with companies on specialized, knowledge intensive projects. It would be safe to say that companies now have access to a buffet of talent which they can mix and match to address the preferences of their customers. Even the social aspect of working in an office has not been spared. Internet sites now allow individuals to rent cheap office space within an organisation for a short time. By doing so, the extended workforce can enjoy the social aspects of work and develop their networks concurrently, further leveraging their influence on social sites such as LinkedIn. These changes are providing companies with flexibility and adaptability. Rather than spending an immense amount of time and resources on training their employees, companies now have agile, high performance, skilled talent at their beck and call. Simultaneously this trend is changing the professional lives of free-lance contractors as well. They now have a chance to work on multiple projects, in different domains and with different companies. The quality of their work creates their online reputation, which in turn, results in them securing their next job. This encourages them to perform, while being able to enjoy complete flexibility in their personal lives. So what does this mean to the future of the workplace? If we were to observe the contributions to GDP of the three primary sectors in today’s economy of the developed and developing nations, the figures show the dominance of the services sector. However on taking into account the emerging trends in the workplace, it would be sensible to infer that technology, global connectivity and intelligent social media will ensure that the global workplace of tomorrow will be one that is an inter-connected knowledge based archetype, rather than a service based one. This fact has been validated by many intellectuals including Joseph Stiglitz & Eli Broad. If we are to adapt to a knowledge based economy the next question in this line of thought would be to ask what defines knowledge. Is it the capacity to absorb facts and figures and be a walking pile of data? Or is it the capacity to link together different pieces of information by having the monkey-wrench of expertise as a sidearm? First let’s concentrate on data. We are on the cusp of transforming our relationship with computers and machines. By the year 2030 it is estimated that over a 100 Trillion sensors will be in every part of our houses, offices and even on our person, incessantly measuring and assimilating data whilst simultaneously interacting between themselves. With the rise of quantum computing and cognitive computing, the possibilities of what insight this data would provide rise exponentially, mirroring the speed of quantum processing. Intelligent AI such as IBM’s Watson will further be able to leverage on this information and will transform every aspect of work. Production, teaching, medicine and even security will enter the realm of this digital universe. As this transition occurs, a number of questions arise: Is information and data accumulation akin to knowledge? Are these machines of the future going to make our places of work obsolete along with us in the process? If so, what will we be doing in order to earn a living? And what are the skill sets that we need to develop in order to survive in this future? These questions do seem pessimistic in nature. But in reality they do offer a future of optimism. As smart machines take over routine manufacturing and services jobs, there will be an increasing demand for the kind of skills that machines are not good at… Namely, thinking. Thinking is a process that cannot be quantified. It is based on curiosity, blemished by experimentation and is incapable of being codified. As the division of labour between machines and humans continues to be renegotiated, it is our inherent ability to come up with Eureka! moments and our adaptability to situations that will emerge as our greatest skill set. Thinking encompasses a wide array of subjects. No computer will be able to comprehend desire, to feel or to empathise. And as we move towards a more collaborative and interconnected society, it will be these ‘skills’ which are inherently human that will become our greatest skill set. Knowledge will be based on our learning abilities and our creativity to be able to use this connaisance to find imaginative solutions to the challenges at bay. It is in this ambience that the extended workforce will truly flourish. Research shows that diversity within an organisation is the core competency for successes. The ability to manage diverse teams whilst respecting a variety of cultures will be the pivotal factor that will enable organisations to redefine efficiency in this new paradigm. Taking these parameters into consideration, a hypothesis of the future workplace begins to emerge: We will increasingly be immersed in a workplace comprised of formal employees, consultant partners and a global grid of contractors, all working in tandem with the public to provide innovative solutions to the needs of the future. An element of commonality in all these jobs is the manifestation of our inherent capacity to adapt and make sense of the environment around us. In other words, our ability to think. Yet, it is often seen that this fundamental ability is often ignored in the current educational system. Or is that about to change? In 2013, Sugata Mitra won the TED prize for his talk on Self Organized Learning Environments (SOLE). Mitra highlighted that the current education system was ‘manufactured’ 300 years ago, in order to address the needs of the industrial revolution. His talk resonated the elemental need to develop the elements of creativity, intelligence and insight in our current education systems, which were also expressed by another education legend Sir Ken Robinson in an earlier TED talk. The point that both these educators were trying to convey was that the trail of monotony found in the current education system, and its emphasis on teaching students to be capable of doing repetitive tasks robs us of our capacity to self-learn and thus our creativity in the process. Apart from this grim reality is the fact that the current education system is a costly business. Students doing a Bachelors or a Master’s Degree end up incurring vast sums of debt. The reasons for the high costs are quite stark. Degrees have become an exclusive commodity, the price of which is fuelled by low admission rates, well qualified students, the promise of high starting salaries and a clamouring sea of applicants. To render the situation even more macabre, the skills learnt at school are not in unison with the needs of the changing workplace. At a time when innovation is the mantra in most organisations, the skills learnt by these students are not always in cohesion with the required skills of the future workplace. As mentioned above, the workplace of the future, is going to be one in which the extended consultant will play a crucial role. In hiring these consultants, companies will ask a single question…Who is the best person for the job? Hence, the begetting question that we need to ask ourselves is how do we become the best person for a task? Would it be asinine to contemplate that only experts would have a chance of establishing themselves in this new ambience? I argue that this will not be the case. The solution evidently lies in our education system. 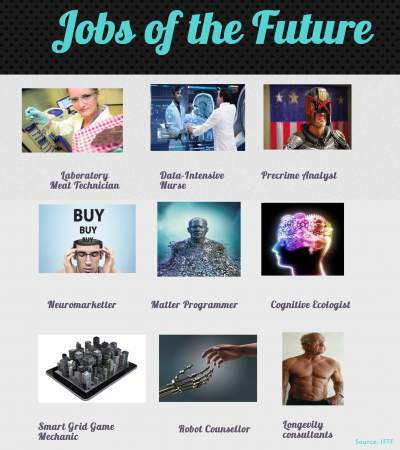 Our education system needs to be overhauled only from an economic standpoint, but also in terms of its pedagogy and the variation of subjects, as exemplified by the Jobs of the Future infographic. Fortunately for us, educators and innovators are already taking a step in this direction. As with the previous section of this article, it would be useful to relook our education system, in order to determine what are the game changing methods and technologies being considered today. Just as technology is giving the workplace a facelift, education, thankfully as well, has not been spared. There is a reduction of fee’s and an increase in outreach of courses. Students can now learn most of mechanical subjects at their own pace and without the need of expensive faculty. As most MOOCs also have forums that are created by the students, they can now gain an experience in learning collaboratively and develop their contacts and networks. Employees can now see graduates as co-workers or entrepreneurs, rather than ill-prepared assembly line workers in a knowledge economy. As a direct consequence, MOOCs also allow faculty to concentrate more time on their research. Hence, instead of paying for research, via student fees, a greater allocation of funds can now be siphoned towards research thus reforming the cost structure at universities. A research report by the Wharton School further shows concrete evidence to this breakthrough. While the current annual cost of creating a journal amounts to approximately $400,000, the cost of creating a MOOC, which allows for a greater reach, is about $11.20 per completing student. Not only does this encourage us to rethink the cost structure at schools, it also allows us to reconsider the productivity and contribution levels of academics to society. As the Internet of Things moves towards the Internet of Everything, the evolution in technology is creating a dearth of technical skills. 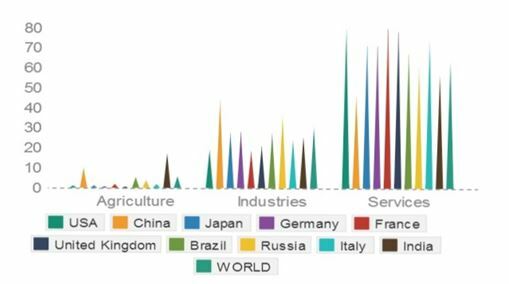 In a recent report by the McKinsey Global institute, it was stated that by 2018 the United States alone might face a 50%-60% gap of between the supply and demand of people with an advanced training in data analysis, statistics and machine learning. As the need for specialists in the fields of data mining, cognitive computing, web based services and content curation begin to increase, the public sector is now entering the field of education providing short courses in the form of Nano-Degrees. The leader in this domain is Udacity, which is currently providing Nano-degrees in Front-end and Back-end Web Development, iOS development and Data analysis. The advantage of Nano-degrees is their focalised nature. Rather than going through an entire course, these degrees focus on a core module and offering a learning style that is extremely collaborative and adapted to the current workplace. Students are given a real time project which they all need to complete by performing multiple tasks. At the end, the tasks are amalgamated with the aid of the course guide, thus leading to the end of the project and the reception of a qualification certificate. Unlike MOOCs, Nano-degrees are paid qualifications. However the cost is quite marginal at around $150 making them increasingly affordable. What MOOCs and Nano-degrees do share is the reception of a validation certificate by an institution or a university, formalising the applicant’s participation and performance. As education becomes increasingly digital, teachers and school leaders have access to an increasing amount of data. This data, which is primarily created by the students, now offers educators the possibility of creating models which discover methodologies and tools for predicting and tailoring courses based on each students profile. One of the leaders in this domain is a Dutch public organisation called Kennisnet (Dutch for Knowledge Net), which is dedicated to ICT-innovation in primary and secondary education as well as in vocational training. Kennisnet provides educational content and information to teachers, pupils and parents and provides IT led educational processes that provide technical and practical support for several innovative educational aids. By capitalising on our innate curiosity, students in the future will not only be able to self-learn but also to innovate. In an education system that is based on curiosity, experimentation and sharing, innovation and entrepreneurship will no longer be a facet but rather an evident characteristic. MOOCs and Nano-degrees will then offer the possibility of developing a specialization in a subject, allowing individuals to become experts in a subject of their choice. The findings in this report highlight the initiatives that are already underway in bridging the gap between the collaborative learning space of today and the collaborative workspace of the future. It also projects that as technology continues to make giant leaps, the future concept of work will be transformed to celebrate our inherent creativity and sociability. But this necessary transition, which has already begun, also poses some serious questions with regards to how we ought to look at the future. A collaborative education system will lead to the creation of an extended workforce. This would lead to the creation of a collaborative economy which will set the stage for a new paradigm of economic growth and prosperity. But are the statistics and parameters used today to measure the productivity of a country, capable of taking into consideration this collaborative evolution of our societies? How will we be able to measure our growth if the fine lines that were used demarcate nations and businesses begin to blur? What are the parameters that need to be adjusted to gauge our prosperity? And who is going to be doing the measuring? Today the measure of an economy’s competency is measured in terms of its GDP. But the biggest contributor to GDP today is the services industry. And the collaborative economy of tomorrow will transform the services sector of all countries. Hence, in retrospect, would it be safe to say that using GDP to measure a countries position in the global map is an outdated concept? Would it not be safer to say that there is an increasing need to establish norms and indicators that measure a countries holistic development which also encompasses human development? The findings of this study prove that the future of the workplace will be not only effect education and society but the way we think of work as well. There is still a long way to go, but the changes in the foundations are already becoming apparent. As MOOCs and Nano-degrees gain more popularity and traction, businesses will need to reconsider the way they look at these qualifications and the way they hire people. This would mean redefining the skill sets required of personnel, reanalysing the importance of their cultural adaptability and measuring their expertise and knowledge as indicated in their journals, blogs and social media contributions. In other words, it would reshape the future of HR. New social indicators that are representative of our future society also need to be considered. It would be counterproductive and foolhardy to continue to use an antiquated system of measurement, when the quantity to be measured in no longer the same. The questions asked in this article are not meant to be an effort of establishing a methodology of ending my thoughts on a Hitchcockesque note. Rather, it is an invitation to think, as the answers to these questions will have solemn ramifications that will reshape our future. Really interesting read. I think every few generations this sort of change has emerged. How had previous generations prepared themselves?